DALLAS (AP) -With the playoffs looming, the Anaheim Ducks are playing at a level that earned them a Stanley Cup last season. 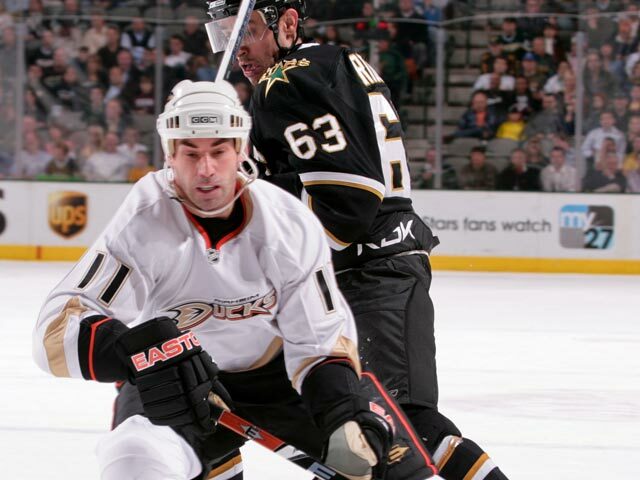 Todd Bertuzzi's power-play goal with 27.2 seconds left broke a tie, and Jean-Sebastien Giguere stopped 20 shots to send the Ducks to a 2-1 victory over the Dallas Stars on Wednesday night. Scott Niedermayer added a power-play goal for the Ducks, 15-3-1 in their past 19 games. With the score tied at 1 and Dallas captain Brenden Morrow in the penalty box for interference, Bertuzzi crashed the net and his close-in shot from a bad angle got under the arm of Dallas goaltender Marty Turco for Bertuzzi's 14th goal of the season. "That was a goal scorer's goal," Ducks coach Randy Carlyle said. "I think it surprised Turco that he shot it from that position. That's what goal scorers do." It wasn't the prettiest of Bertuzzi's 240 career goals, but with time winding down, he simply wanted to get the puck on net. "I didn't have a lot of time," Bertuzzi said. "I just wanted to get it there as fast as possible." Anaheim strengthened its grip on second place in the Pacific Division behind San Jose, moving three points ahead of third-place Dallas. "It's a good rivalry (with Dallas)," Bertuzzi said. "These are fun games to play going into the playoffs. It's a big win for us." Turco took all the blame for Bertuzzi's goal. "It was a bad angle that I got a piece of but it went in," Turco said. "It's one I'd like to have back but I can't. It was a save that needed to be made." Morrow scored a short-handed goal for the slumping Stars, who lost their third in a row and are 1-6 in their past seven games. Morrow wasn't sure if he deserved a penalty on the late interference call. "I'm in a pretty bad mood right now," Morrow said. "I don't like to see a game decided like that. It's frustrating. After all the stuff (the referees) let go, that was kind of middle-of-the-road. With the exception of (Scott) Niedermayer, you could call a penalty on their defense on every shift." Dallas had been 5-1 against Anaheim this season, 8-1-1 in the past 10 meetings. The game was a possible first-round playoff preview. "It's important with the way things have been going this year," Giguere said. "It was good we beat them here. Most likely we're going to see them in the playoffs. It's going to be a good battle." Anaheim got off to a slow start, failing to register a shot in the game's first 11:35. "We were on our heels early and were fortunate to get a win on the road," Bertuzzi said. Morrow's breakaway was the only score of the first period. Turco sent the puck along the boards in a clearing attempt during a Ducks' power play, and when Anaheim defenseman Mathieu Schneider fell while trying to glove the puck at the right point, Morrow took possession with nobody back for the Ducks. Morrow skated in alone and beat Giguere from the slot for Morrow's 28th of the season at 12:34. The Ducks tied it at 1 at 4:08 of the second period, five seconds into a power play, when Niedermayer's shot from the right circle went through Turco's pads for Niedermayer's seventh goal of the season. Notes: Dallas C Steve Ott completed his three-game suspension for a hit to the head of Colorado's Jordan Leopold. ... Anaheim D Chris Pronger served the second of an eight-game suspension for stepping on the leg of Vancouver's Ryan Kesler. ...Also out for the Ducks: RW Corey Perry (quadriceps) and C Ryan Carter (wrist). ... Turco got the only assist on Morrow's goal, Turco's third of the season and 13th of his career, the most by a goalie in franchise history. ... Morrow has five goals against the Ducks this season. ... The Liverpool FC reserve team, competing in a Dallas-area soccer tournament, watched from a luxury box. Stars owner Tom Hicks is co-owner of Liverpool FC, but Hicks was not at the game.